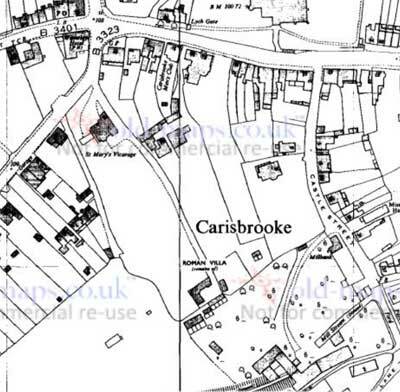 Carisbrooke Roman Villa was uncovered in 1859 during construction work for new stabling at Carisbrooke vicarage. The villa appeared to be an aisled building with a later bath suite in the south end occupied between the early years of the third century AD to the early fourth century. It was suggest in 1977 that the main villa may still remain to be found. The site is on private land and not accessible to the public (2018).